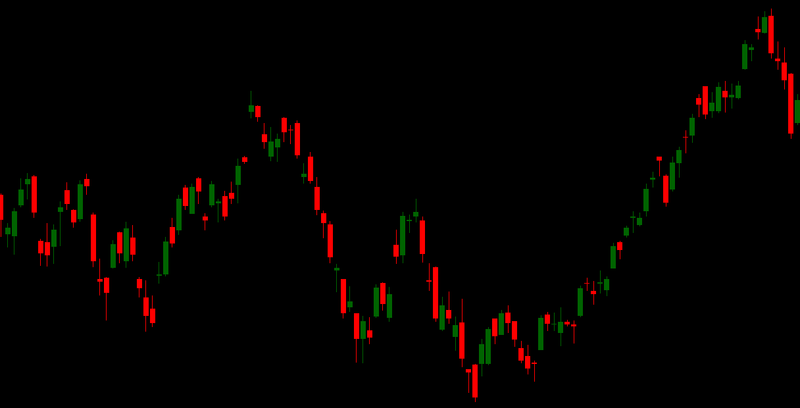 Stock markets are the reflection of the price movements which are the results of human behavior. The human psychology is same among all of us (exceptions are always there). When price moves up, traders or investors hurry to buy stocks for quick gains or vice-versa. But prices doesn’t move the same way the large psychology expects. Here, we are going to explain the markets from different perspective which may contradict human psychology but far more rewarding for traders or investors. Do news drive the stocks? Yes, all of us hear from stock market experts the news reflects the move in prices. Most of the times it does but in opposite side. Wolf wave strategy is out the box way to earn profits. It is hard to go with the view which the strategy tells but if we go with this the strategy can be drastically rewarding. Do you wonder from where the latest up move came? We may not. Let us discuss how. Wolf wave strategy is a failed wedge strategy where many analyst will say that pattern created a whipsaw, but actually it has not. By starting with a top or bottom on the bar chart, we are assured of beginning our count on a new wave. 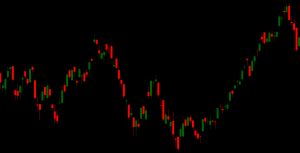 This count is for a buy setup. We begin the count at a top. (The wave count would be reversed if we were starting at the bottom looking for a sell setup). Number 2 wave is a top. Number 3 wave is the bottom of a first decline. Number 1 wave is the bottom prior to wave 2 (top). Point 3 must be lower than point 1. Number 4 wave is the top of wave 3. The wave 4 point should be higher than the wave 1 bottom. A trend line is drawn from point 1 to point 3. 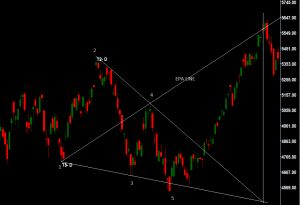 The extension of this line projects to the anticipated reversal point which we will call wave 5. This is the entry point for a ride to the EPA line (1 to 4). The Estimated Price at Arrival (EPA) is the trend line drawn from points 1 to 4. This projects the anticipated price objective. Our initial stop is placed just beneath the newly formed reversal at point 5. It can then be quickly moved to breakeven. Point 1, 2, and 3 must already have formed. Point 2 must be a significant swing low or high. A trend line is then drawn between points 1 and 3. This projects where we should anticipate point 5. Point 5 is formed. We will buy the reversal from this area and place a tight stop underneath. If we draw a trend line from point 1 to point 4, it should give us a price projection. Now let us discuss the same chart above with markings of same rules. 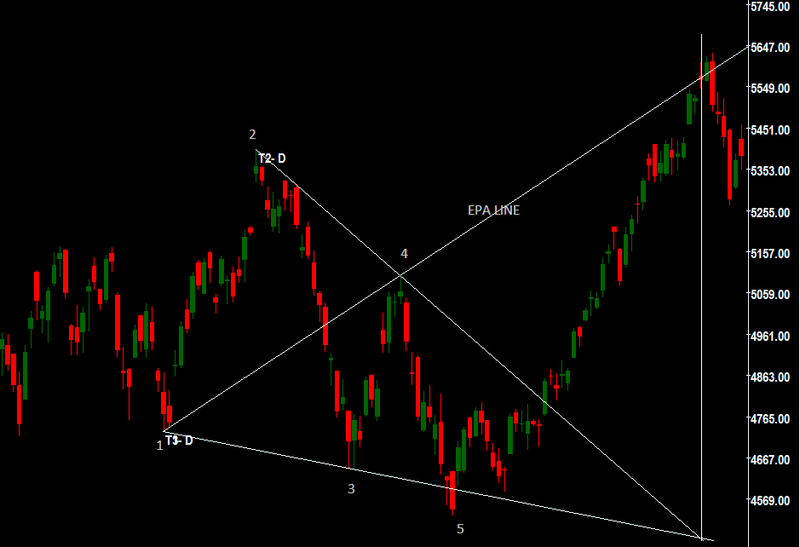 The above chart is NIFTY 50 which many will wonder why we were not able to catch this up move. Wolf Wave system is most suited for those who can bear small losses certain times but have patience to get themselves rewarded very huge. But still it is not the Holy Grail.